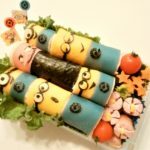 Japan has been adopting many things from other countries mainly from Europe and America, and transforming into Japanese style, making the goods “Japanized.” Snacks are no exception. When sugar started to be imported in the 1500s, snacks using sugar were invented. As industrialization and modernization progressed in the 19th century, popular snacks such as cookies and chocolate flowed into Japan from the Western countries. After that, a lot of confectionary companies were established and produced snacks, with changing Western snacks into Japanese style. Those confectionary companies such as Morinaga are still dominant in the confectionery market. In Japan, snacks come and go very quickly, so few snacks can get classic. The followings are 17 best Japanese snacks which have been popular among people for a long period. Once you try them, you cannot resist anymore. 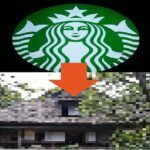 Even if you are not planning to visit Japan, don’t worry. You can buy those delicious snacks online. Let’s go and find out what you like. 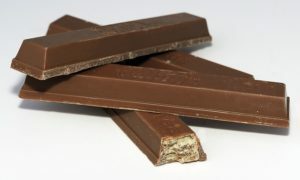 You may think that Kit Kats are no different depending on the country. Flavors you may come up with would be just milk chocolate and dark chocolate. But Japanese Kit Kats come in an astonishing variety of flavors. They do taste just as the picture on the package. Regular flavors include milk chocolate, dark chocolate, green tea, and strawberries, but unique flavors are seasonally and regionally limited. For example, caramel pudding, strawberry cheesecake, raspberry flavors get a debut in spring. Locally specialized flavors include Japanese sake, sweet red beans, wasabi, sweet potato, Hokkaido melon, etc. Japanese Kit Kats also have special varieties that you can enjoy by heating in the oven or cooling in the fridge. If you travel to Japan, make sure to leave a space for putting all sorts of Kit Kats! Pocky has many types of cookies and flavors of chocolates. Other than normal thin cookies, there are a heart-shaped version, thicker version, chocolate-flavored version. Various flavors of chocolate include strawberries, green tea, almond crush, rose champagne, melon, grapes, cherries, and orange, some of which are regionally limited. Pretz, which is also from Glico, is a thin cookie-like snack. It is like Pocky without chocolate, but Pretz has a taste in cookies themselves, and flavored powder is sprinkled on them. Similar flavors include salad (salty flavor), tomato, and butter. Seasonally limited selections include sweet potato and shrimp, and locally specialized versions have takoyaki from Osaka, mentaiko from Fukuoka, wasabi from Yamanashi, and so on. Kinoko no Yama is a common Japanese snack launched by Meiji more than 40 years ago, and it has become a staple snack in Japan. As the name Kinoko indicates, it resembles the shape of mushrooms. It has a crunchy biscuit on the bottom and chocolate which seems the head of a mushroom on top. It comes in different flavors such as chocolate, green tea, strawberries, and dark chocolate. You can find different flavors in different parts of Japan, too. 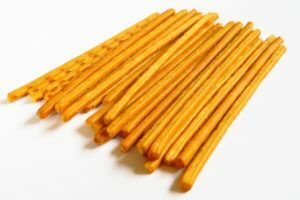 Takenoko no Sato, also invented by Meiji is a sister snack of Kinoko no Yama, which resembles bamboo shoots. 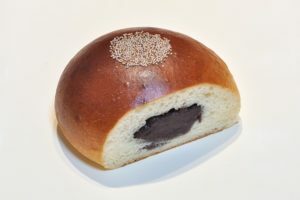 It is made with a cookie bottom shaped like bamboo shoots and chocolate on top. It has similar variations in flavors to Kinoko no Yama. With similar characteristics, Takenoko no Sato and Kinoko no Yama often compete for each other to get more supporters. Even customers are also debating about which product is better! How about you? 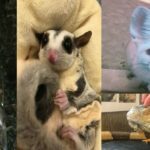 Are you for Kinoko no Yama or Takenoko no Sato? Koala no March is produced by a confectionary company Lotte, which is a popular snack among kids. It composes a koala-shaped biscuit filled with chocolate. Regular flavors include chocolate and strawberries, and seasonally limited versions come out depending on the season. The mascot characters, March-kun and Waltz-chan, are printed on the cookies, creating a cute appearance on the product. According to the Lotte website, there are 365 patterns of prints! In Japan, snacks which combine chocolate and biscuits/cookies catches many people’s minds. Alfort from Bourbon is one of them. It has a rectangular-shaped biscuit with chocolate and comes in 12 pieces in a package. Different flavors in biscuits and chocolate are available; plain biscuits with milk chocolate, dark chocolate biscuits with white chocolate, plain biscuits with butter-rich chocolate,,, etc. Seasonally limited versions are also released, for example, a strawberry chocolate flavor in spring. Jagariko is a type of potato snack widely spread across Japan. Mashed potatoes are mixed with flavors and ingredients, shaped into sticks, and then fried. It comes in various flavors and sizes. Basic flavors have salad (salty flavor and contains a bit of vegetable), cheese, Jaga-butter (potato and butter), and Tarako-butter (cod roe and butter). Other flavors include yuzu and black pepper, Japanese plum, corn and butter, soy sauce, nori (seaweed), and nikujaga (common Japanese simmered dish). In autumn, Satsumariko is produced as a seasonally limited version. Satsumariko uses sweet potatoes instead of potatoes. A large space is taken for Satsumariko at supermarkets and convenience stores because of its huge popularity among sweet potato-lovers. 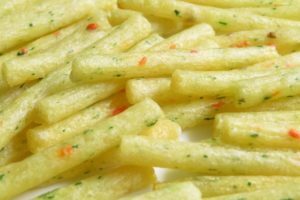 How can potato chips be unique to Japan? Regular flavors of potato chips worldwide would be salt, sour cream, and black pepper, but common flavors in Japan are different; sea salt, seaweed, and consomme (chicken stock) are the most popular ones among Japanese people. 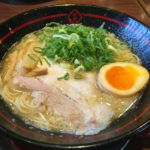 Other than those flavors, there are numerous variations in flavors which cannot be found in other countries such as pizza, wasabi, and seasonally/regionally limited flavors include Japanese plum, banana, garlic, cheese cheese cheese, avocado mayonnaise, tartar sauce, peach, Takoyaki, soy sauce, and butter, etc. 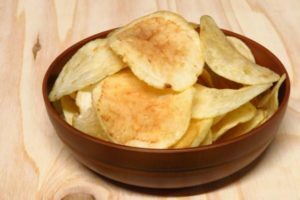 Trying different flavors of potato chips will be an exciting experience during your stay in Japan, and with their lightweight and a small portion, they will be a great choice for souvenirs. Kappa Ebisen is a shrimp flavored puffed snack invented by Calbee in 1964. Shrimp flavor may sound peculiar, but just try! It is tasty! As the catchphrase “Yamerarenai-Tomaranai (I can’t resist, I can’t stop)” says, the savory shrimp flavor made from actual shrimp makes you grab another piece. 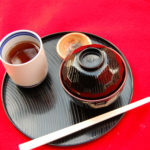 It comes in different flavors depending on the season and the region, such as garlic soy sauce, lemon, bonito stock, Japanese plum, Takoyaki, wasabi, and so on. Hi-Chew is a soft, chewy candy released from Morinaga more than 30 years ago. It has been one of the most popular candies in Japan. One-bite size candy is wrapped one by one and then packaged in a colorful, appetizing package with 12 pieces. Juicy fruit flavors made from actual fruits will spread in your mouth once you chew. Also, the initial texture is like bubblegum, and as you keep chewing, the candy gets softer. 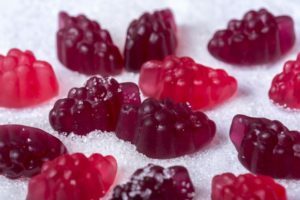 Standard flavors are grapes, strawberries, and green apples, and other variations include coke, lemon, soda, and so on. Some flavors such as peach, melon, orange, pineapple, or mango became local specialties in a particular region. Hi-Chew is now sold worldwide, especially Asian countries, America, and New Zealand. Gummy candies have been a common selection of snack in Japan. Different confectionary companies cator such a wide range of gummies that it is difficult to list all of them. One of the most popular gummy candies is Kaju-gumi from Meiji, which uses actual fruit juice for flavoring. 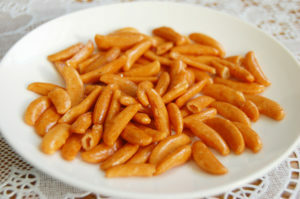 Pure-gumi from Kanro is a very popular sweet among women due to its cute heart-shaped appearance and a little bit of sour powder put on the sweet gummy. Kororo from Uha-Mikakuto is such an invention, and everyone is struck by its unimaginable texture. A thinly-coated gummy pops in your mouth once you chew, and soft juicy gummy flows out and fills your mouth with delicious juicy fruit flavor. It is just like you are eating real fruits! 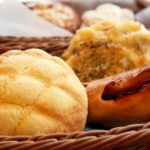 Japan has been creating unique varieties of bread and has made bread something different you can find in other parts of the world. 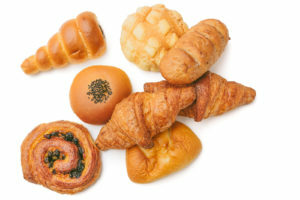 Japanese bread is known for a wide range of sweet bread, such as melon pan (regular bread covered with soft cookie-like dough), anpan (a roll filled with red bean paste), creme pan (a sweet roll filled with custard), and milk-france (a baguette with milky cream sandwiched). Bakeries, supermarkets, and convenience stores carry many types of sweet bread, and they make a nice dessert after a meal or a snack. Senbei is a cracker made from rice. It is said to be brought from China in the 6th century, and remains as a classical Japanese snack. 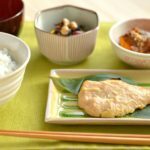 It comes in hundreds of flavors, shapes, and sizes, but the most familiar type is a round-shaped, soy sauce-flavored senbei. 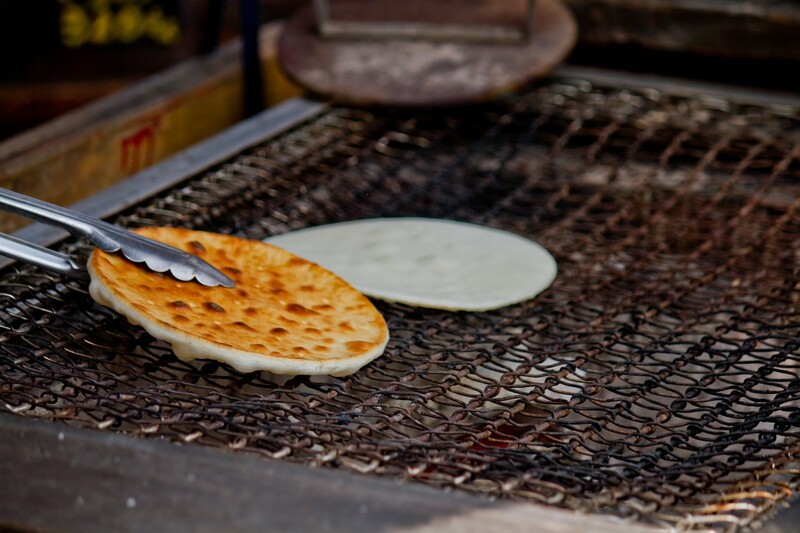 Sightseeing spots make senbei one of the local specialties, and you can buy it fresh off the grill. Senbei is also available at supermarkets, convenience stores, and local sweets shops. Kaki no Tane are rice crackers with a distinctive shape that resembles seeds of persimmons. 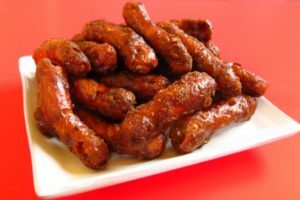 They are a little bit spicy, have a crunchy texture, and go well with alcoholic beverages. 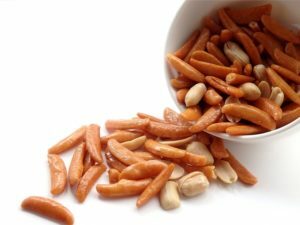 Kaki no Tane are usually packed mixed with peanuts. They come in some varieties of flavors such as wasabi. If you are not a fan of peanuts, a package that contains only rice crackers is available. 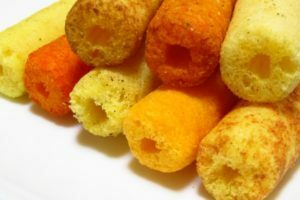 Umaibo is a puffed, cylindrical corn snack. Umaibo is known for its various flavors and extremely low price. 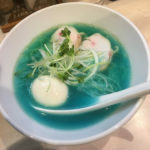 Flavors include corn potage, cheese, salad, Takoyaki, teriyaki burger, tonkatsu sauce, mentai (spicy cod roe), chocolate, chicken curry, pizza, yakitori, and many more. The price is just 10 yen, so it makes a great souvenir to take back home. 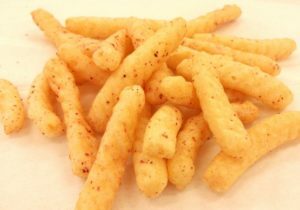 Karinto is a traditional deep-fried Japanese snack made with flour, water, sugar, yeast, and salt. 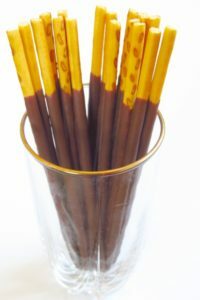 It has a stick-like appearance and coated with sugar syrup. Karinto may not be as easy as other modern snacks to find, but it is sold at candy shops which mainly sell nostalgic Japanese snacks and at department stores. Some Japanese-style hotels also serve it as a welcoming snack. A variety of flavors are produced these days, such as vegetables, sesame, green tea, peanuts, and so on. Get your stomach full of these delicious snacks! Since Japan is a food paradise, you may wonder what to pick to please your mouth. Then, why don’t you try these 17 snacks? 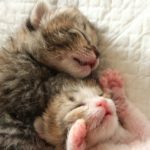 They will definitely give you a moment of joy.